Shimkus was commenting during a visit to Vermilion County. He says at Congress gets back to work he will be busy with committee work…. 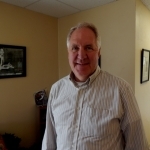 Congressman John Shimkus was commenting during an interview with VermilionCountyFirst.com News.